The French 6×6 VAB aka Véhicule de l’Avant Blindé Family ticks many boxes in the world of Armoured Fighting Vehicles in terms of success. It is a flexible platform thanks to its non complicated design and is capable of filling many roles on the battlefield. It is in service with a multitude of nations in these roles aka variants in 4×4 and 6×6 versions. 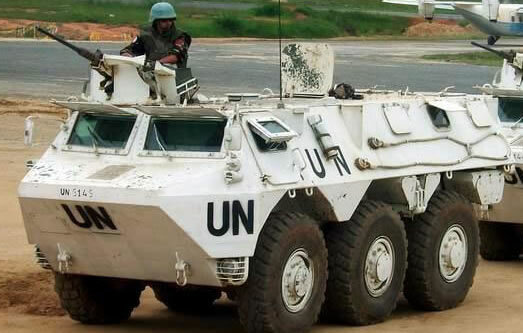 The vehicle was initially developed by French state arms manufacturer Giat. French firms Renault Truck Defence and Panhard built prototypes of the vehicle in both 4×4 and 6×6 versions. The French Army then placed an order for several thousand with Renault selected as the manufacturer. It entered French service in 1976. The vehicle is powered by a turbo-charged Renault MIDS 06.20.45 diesel water cooled 220hp engine. This provides a 92km/h top road speed and a operational range of 1000km’s. The vehicle is fully amphibious and powered in the water by two rear propellors, giving a top water speed of 8km/h. 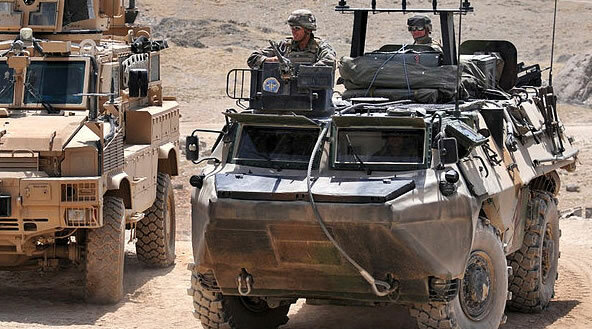 The vehicle is an steel construction (unspecified thickness) giving the vehicle an all round protection against 7.62mm MG fire and artillery anti-personnel splinters, as well as some types of mines meeting protection level 1 STANAG 4569. The vehicle can be fitted with appliqué armour to increase this level. The vehicle has an internal NBC protection system. Front section has the driver on the left and commander on the right, with a cupola which can mount various MG’s. The middle of the vehicle has the engine compartment on the left (behind the driver) and a small corridor on the right link the front cab to the rear section. The rear section serves the purpose of housing the equipment of the vehicles role. Most common variant, x2 crew and x10 troops in the rear section on benches. Vehicle has a 12.7mm MG operated by the commander. APC with a roof mounted traversable turret with a 20mm Chain Gun. Armoured Recovery Vehicle for the VAB family. Equipped with hydraulic jib crane for swapping power pack and winches for pulling VAB’s free of obstacles. Vehicle mounts either a UTM 800 turret or Mephisto turret, which both have x4 ready to launcher firing tubes. They both fire the French HOT (Haut subsonique Optiquement Téléguidé Tiré d’un Tube) Anti-Tank Missile. The HOT is a wire-guided missile with semi-automatic command-to-line-of-sight (SACLOS) guidance. Its been around since the 1970’s and the latest version is the HOT-3. Carries Combat Engineer’s and their equipment. Medical evacuation vehicle. Rear section accommodates medic’s, equipment and wounded. Tows a 120mm mortar system. 81mm mounted internally (most likely on a turntable) and fired from within the vehicle when roof hatches are opened. Vehicle operates a Anti-Aircraft Gun comprising x2 20mm guns. Equipped with various external sensors and equipment for taking soil samples for testing contamination levels. 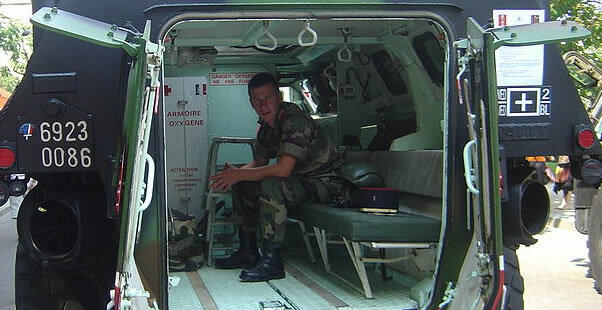 France – 3900 VAB in a reported 35 different variants in both 4×4 & 6×6 versions. France has had a strong input in Africa and been involved in a number of military operations in the Ivory Coast and Chad. They have also contributed to the Gulf War as well the UN/NATO Peace Keeping forces in the various wars in the former Yugoslavia and through out all these conflicts, the VAB in its many roles has been there with the French Forces. VABs belonging to the Royal Moroccan Army ( FAR ) have seen heavy combat during the conflict with Polisario rebels of the Western Sahara. France has also contributed to the International Security Assistance Force (ISAF) which is a NATO-led security mission in Afghanistan and again deployed the VAB. The vehicle has held its own in a number of attacks, but sadly a very small number have been killed. Since forming part of the ISAF effort in Afghanistan, deployed vehicles are being equipped with remote weapons station so as to avoid crewman being exposed to enemy fire. They have also received appliqué armour kits increasing all round protection to withstand 12.7mm MG fire. The French Army are currently seeking a replacement for the VAB scheduled for service entry around 2020.